English and French churches in Gothic style were constructed of stone masonry with pointed arches, ribbed vaults and a buttressing system to counteract the outward thrust of the stone vaults and the weight of the timber roofs. English Gothic cathedrals tend to be long and moderately high. Salisbury is 82 feet from the floor to the apex of the high vault. Cathedrals in such French towns as Chartres, Reims and Amiens are exceedingly tall, from 100 to 120 feet to the apex of the vault. Because the French masons opted for height, they employed a visually flamboyant system of structural supports--flying buttresses--so called because the aches that abut the clerestory wall "fly" over the side aisle roofs. The support system of French cathedrals is, therefore, apparent on the exterior and creates a massive forest of soaring masonry all around the building. Salisbury has arches performing a similar buttressing function as the French "flyers," but they are hidden beneath the roof. Visitors to Salisbury today will see a few flying buttresses, particularly around the tower, but these have all been at a later date. The original design of the building in the thirteenth century would have created the illusion that the building stood without a prominently visible system of support. Architectural historians have suggested that English masons at Salisbury were "behind the times" because they did not utilize flying buttresses or other contemporary French features, but I suggest that English masons and their patrons chose to build a cathedral that suited their taste and did not copy French models. The architecture of Salisbury Cathedral is light, refined, delicate, full of nuance and unexpected but unobtrusive details . The skill of the mason is everywhere apparent if you know where and how to look. In the Trinity Chapel, for example, exquisitely thin Purbeck shafts that, in truth, can support very little weight, appear to hold up the stone vaults without effort. 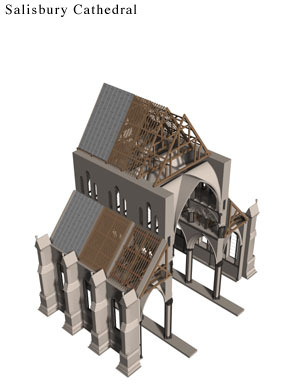 The two models show the nave of Salisbury Cathedral as it was designed in the thirteenth century, and, imaginatively, the nave as if it had been constructed with the French structural system. Compare the two versions. 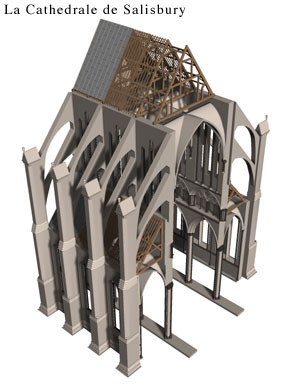 The English model has buttresses at the outer walls of the aisles, quadrant arches under the roofs abutting the triforium wall, an ornate triforium that opens on to the roofs of the aisles, a short clerestory of triple lancet windows, and a passage at clerestory level where the walls are built double with an inner decorative row of arches on slender Purbeck shafts, and an outer wall of masonry. For the French version the model has been stretched to accommodate a much taller main arcade and clerestory. In the French manner, the triforium has a passage between the decorative arcade and a wall of solid masonry behind it. The area under the aisle roofs is not visible as it is in the English model. There are two levels of flying arches, the lower one counteracting the outward thrust of the vaults, and the uppermost bracing the clerestory wall and counteracting the thrust from the wood roof and its heavy lead sheathing.